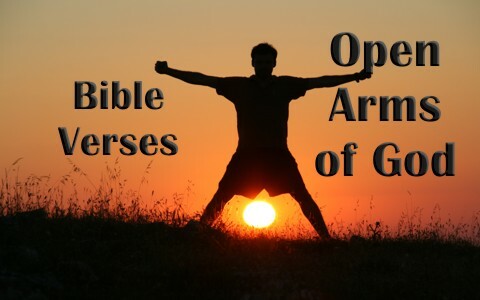 Here are seven encouraging Bible verses about the open arms of God. This might be one of the most favorite of all parables, because I think most of us can identify with it. Even though Jesus never calls the son a prodigal, it’s known as the Parable of the Prodigal Son. When the younger son took his inheritance and squandered it on, I am sure, sinful practices, he came to himself after he was lowered to the status of “pig feeder,” and went back to the father, wanting to tell him that he was unworthy to be his son any more (Luke 15:21), however the father had been watching and waiting, and when he saw his son, he ran to greet him and embrace him and shower him with kisses. That is a vivid picture of all of us, once prodigals, whom the Father ran to (showing, He initiated the saving) after the son had repented (come to himself). I believe some of those listening to Jesus knew what He meant when He said He would be “lifted up from the earth.” Did some think He was referring to His ascension to heaven and returning to the Father? Or did they think it about His being killed on a cross? It was probably the latter, because Jesus “said this to show by what kind of death he was going to die” (John 12:33), and they responded by saying, “We have heard from the Law that the Christ remains forever. How can you say that the Son of Man must be lifted up” (John 12:34), so they thought when the Messiah would come, He would abide forever. Of course, they didn’t understand that it was for this reason that He came into the world (Mark 10:45), and eventually He will abide forever. The Apostle Paul must have loved the Old Testament, not just because he was expert in them, but he made so many references to “Scriptures” because they supported what he was trying to teach them. One of these teachings was when he was writing about proclaiming the gospel to all nations and people, and that you don’t have to be from the seed of Abraham to enter the kingdom, only “confess with your mouth that Jesus is Lord and believe in your heart that God raised him from the dead, you will be saved” (Rom 10:9). It’s “good news” because “there is no distinction between Jew and Greek; for the same Lord is Lord of all, bestowing his riches on all who call on him” (Rom 10:12), so even in Israel’s case, God still held out his “hands to a disobedient and contrary people,” very much like us at times, right? Have you ever been troubled about your standing before God after you have already been brought to repentance and faith in Christ? If so, or someone else you know feels this way, they (and you) should read John chapter 6, and I would add, John chapter 10. In fact, how about the whole Gospel of John! The words of the Good Shepherd assure us, His sheep, that if He begins with 100 sheep, He will come home with 100 sheep, so “that I should lose nothing of all that he has given me, but raise it up on the last day” (John 6:39). Jesus is telling His own sheep that all that the Father has given to Him, (the church, or His bride), will come to Him and stay with Him. And add to that, He says, “whoever comes to me I will never cast out,” which indicates that everyone is invited to the wedding feast of the marriage of the Lamb of God with His bride, the church. Jesus went from seeing the children, and probably the parents being rebuked by bringing them to Jesus, to rebuking the disciples for keeping the children from Him. Sometimes parents or grandparents can get in the way. We should never brush off our children’s or grandchildren’s words when they tell us about Jesus or have questions about Him. Don’t think they’re “too young” or not mature enough. I have seen what “maturity” can do, and frankly, it’s not that great. Jesus loved the little children because they were so honest, trusting, and teachable. If you are these three, then you are child-like. No wonder Jesus told us that we must become as little children (Matt 18:3), because some of our adult maturity has messed us up! When Jesus was speaking of Himself being “lifted up,” He clearly meant the crucifixion, but His reference to ancient Israel and the bronze serpent is interesting. The people had grumbled against God and Moses and so God sent them “fiery serpents” (Num 21:6) who bit them, and the only way that they could live would be to look at the bronze serpent on a pole (Num 21:9), and in the same way, the Jews had been grumbling against God in Jesus’ day; actually grumbling to the face of God (Jesus Christ). Jesus may have used this example to tell them that if they didn’t look to the Son for life, they would be bitten by something far worse than fiery serpents (Rev 20:12-15; 21:8). That is why Jesus said, it “is the will of my Father, that everyone who looks on the Son and believes in him should have eternal life, and I will raise him up on the last day” (John 6:40). What a powerfully encouraging Bible verse this is and it “is the blessing with which Moses the man of God blessed the people of Israel before his death” (Deut 33:1), so this is Moses encouraging the congregation of Israel, knowing his death is near, that only “The eternal God is your dwelling place,” where you’re “underneath the everlasting arms,” arms that are open still today ready to receive all who come to Him in faith. God has destroyed the last enemy, and that is death, through Jesus Christ. That enables believers to have an eternal dwelling with the eternal God, and be under those “everlasting arms” for all time. If you picture the cross, or you’ve seen a picture of Calvary, then you can see that Jesus’ arms are open wide for all to come, and He says, “Come to me, all who labor and are heavy laden, and I will give you rest” (Matt 11:28). More than that, He tells all to “Take my yoke upon you, and learn from me, for I am gentle and lowly in heart, and you will find rest for your souls” (Matt 11:29). Just as our yokes are hard and our burdens are heavy, Jesus says, “my yoke is easy, and my burden is light” (Matt 11:30). Even a child can understand this. Previous post: Can You Frustrate God’s Grace? Next post: What Does It Mean To Be A Slave Of Christ?